Enoy the the fasciating Ho Chi Minh Tour Package with sightseeing tour from Historical President Palace and amusing shopping in Ben Thanh Market, learn about Vietnam War in Cuchi tunnel. Experience the contrasts of South Vietnam from the charming chaos of Saigon to the relaxing waters of Floating Market in My Tho. This four day Discovery Tour is a fabulous introduction to the country and its culture. Begin your journey in the former capital city with a sightseeing tour tour. 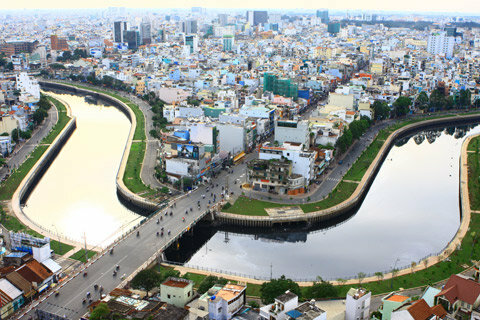 Visit the President Palace and the War Museum for a touch of history before heading through the busy Ben Thanh Market. Relax at the end of the day with a coffee at a local lakeside café and marvel at the seemingly endless stream of motorbikes. Leave the buzz of the city behind as you travel south to the Mekong River Delta and board a traditional wooden Sapan. An fasciating cruise on the river is the perfect opportunity to truly appreciate the beautiful waters, see closely to local life on water and interfere to shop form local shop and enjoy fresh seafood fresh.. Qualifications : Exellent foreign languages, professional presentaion skills, knowledges, helplessness, friendliness, expreriences. Tags: Ho Chi Minh Tour Package, Ho Chi Minh City Tour, Ho Chi Minh Muslim Tour Package,Vietnam Package Deals, Cu Chi Tunnels Tour, Mekong Delta Tours, Vietnam Tour Packages, Danang Tour Packages, Hanoi and Halong Bay Tour Packages. Today you will land in Ho Chi Minh City (Tan Son Nhat International Airport). Warmly welcome by Viet Prestige Travel's Tour Guide & Car Driver at airport then transfer to hotel for check in. Stay overnight in Ho Chi Minh City. Havving breakfast at your hotel, it is free for leisure & shopping until transfer to Airport for your flight. Farewell the unforgettable Vietnam trip with Viet Prestige Travel. Good bye & see you in the next time! What do you think of Ho Chi Minh Tour Package 4 days/ 3 nights?